I often have restaurant operators asking me about how to manage their menus. At the MMS Catering Institute we believe that catering out of restaurants is a separate business; a business unto its own. When it comes to menu pricing, I’d like to put forward the following recommendation. Check you this video for my perspective. I am so proud of my team at MonkeyMedia Software and the MMS Catering Institute. This generous article was written by Alicia Kelso and featured on Pizza Market Place. I’ll repost here because it’s really something to be proud of and it speaks the truth. Hope you enjoy it! Let’s talk catering!! Chicago-based Rosati’s Pizza has been around since 1964. Since that time, the company has offered catering meals featuring beef, chicken, pasta and pizza. But now the nearly 200-unit chain is adding off-premise catering — not just a carryout option as it’s been, but a separate revenue channel and business, complete with devoted staff, training and packaging. Because of increased competition and consumer demand, now is the right time to enhance the service, according to Rosati’s president Marla Topliff. “Pizza is pizza; it’s not going to change. You either add another dimension or you don’t grow. We’re all looking for that next step to take and catering is probably it,” she said. Rosati’s recently selected MonkeyMedia Software to set up its new program, and hired a new catering director in Jennifer Freskos. The chain is currently onboarding its off-premise catering program via MonkeyMedia Software’s Catering Institute. “It’s not a giant leap, but it is adding a giant dimension to make it more profitable for stores and to add more revenue,” Topliff explained. MonkeyMedia’s Hillary Jacob, senior catering analyst, is helping Rosati’s with the process and said the biggest difference between this program and the previous one is the customer service dimension. “Now, when you have a catering call, the customer will talk to a trained catering rep; someone who is trained on the menu and can help them plan their meal for any occasion. Delivery is stepped up a notch as well — they’re in uniform, they greet you, they set up your meal, take lids off of pans, simple things like that. These little steps of service add up and make a great experience for the customer,” Jacobs said. MonkeyMedia’s Catering Institute includes back-of-house training, delivery, customer service, CRM, sales and marketing and more. A brand that chooses to undergo such training then becomes certified by the company. Time and money spent varies depending on the size of the brand. Freskos said there is not only an increased demand for off-premise catering but customers want these service upgrades as well. “The biggest focus is on business to business consumers — the power lunch, the client meeting, etc. That’s why we need to have that top customer service every step of the way — from the initial call to picking up the boxes afterwards. These customers are too busy to worry about all of that,” she said. “I could see it becoming about half of the business. The opportunity for catering is so huge right now. 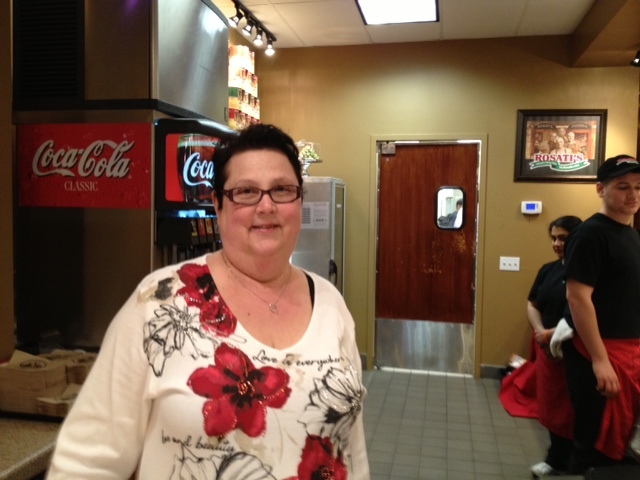 It gets customers fed the way they want to be fed and when, and that’s what they want and need right now,” she said. The Rosati’s catering menu extends well beyond its signature pizza. Freskos said it’s important to include a variety of options, such as sandwiches, salads and antipasta, and there are also some “non-mainstream” entrees, such as chicken Marsala and lemon chicken, as well as new desserts. (See some of themenu items here). Rosati’s will market the service with a sampling program, bringing food to target customers. It will also be heavily advertised in stores, on the brand’s website and through social media channels. A My Rosati’s Catering Facebook page was recently created, for example. Rosati’s is in the process of certifying restaurants to include the new catering service and will add a “few at a time.” Topliff said the company needs to start small, test and make sure it’s right before going chain-wide. Every store that includes the program has to be certified before going live — that includes training for the entire staff. Training covers operations, marketing, menu knowledge, how to upsell, how to answer phones and identify different buyers, back-of-house training and more, Jacob said. Once the foundations are in place at each store, the MonkeyMedia software will be rolled out. The web-based application enables operators to manage sales, orders, payments, production sheets, order distribution and more. Through this platform, for example, Freskos will be able to look up every order a client has ever placed, complaints, compliments and more. To ensure its success, Rosati’s has developed a catering council. Topliff said this allows store owners to provide feedback and menu ideas. A recent report from marketing research firm Technomic projects gains in consumers’ use of restaurants for catering of 5-plus percent annually. Not only do customers want the service, but operators are seeing the benefits as well. “If executed properly, operators can expect $1,000 a day in incremental sales per restaurant,” Jacob said. Topliff said the biggest hurdle for many is to try something new.